After almost 14 years as a state company, British Airways was privatised in February 1987 as part of a wider privatisation plan by the Conservative government. British Airways current fleet stands at 268, and it is mainly made of 67 Airbus A320 aircraft; 12 Airbus A380s; 25 Boeing 787 Dreamliners, and 36 Boeing 747's. The centrepiece of the airline's long-haul fleet is the Boeing 777, with 58 in the fleet. An ATR 72-600 (XA-UYY) of Aeromar was doing engine test runs at Mexico City-Benito Juárez International Airport (MEX) when the aircraft jumped the chocks. It continued taxiing until the right hand engine impacted the rear fuselage of an another Aeromar ATR 42-500 (XA-UAV). The tail cone and rudder of UAV sustained substantial damage. Transportes Aeromar operating as Aeromar, is an airline based in Hangar 7 of Zone D of the General Aviation Terminal at Mexico City International Airport in Venustiano Carranza, Mexico City, Mexico. Aeromar operates scheduled domestic services in Mexico and international services to the United States. Its main base is Mexico City International Airport. Aeromar was established on 29 January 1987 and started operations on 5 November 1987 as Transportes Aeromar. It is owned by Grupo Aeromar and had 864 employees in July 2010. On 1st April 2010, Aeromar signed a commercial alliance with Continental Airlines. Aeromar then announced it would lease two Bombardier CRJ200 regional jets. These twin jet aircraft were subsequently removed from the airline's fleet. On August 30, 2010, Aeromar and Continental Airlines announced a frequent flyer partnership that allowed each carrier's passengers to earn and redeem miles on either airline. In addition, Continental international first- and business class passengers, Presidents Club members and Star Alliance Gold customers were able to access Aeromar's Salon Diamante lounge in Mexico City at that time. On the 27th March 1977, 41 years ago today, two Boeing 747 passenger jets, KLM Flight 4805 and Pan Am Flight 1736, collided on the runway at Los Rodeos Airport on the Spanish island of Tenerife, killing 583 people, and making it the deadliest accident in aviation history. At 12:30pm a bomb explodes in the Las Palmas passenger terminal. Because of warnings of a possible second bomb, the airport was closed. A large number of flights were diverted to Tenerife. Like KLM Flight 4805 from Amsterdam and PanAm Flight 1736 from Los Angeles and New York. Las Palmas Airport re-opened to traffic again at 15:00. Because the PanAm passengers remained on aboard it was possible to leave Tenerife at once. The taxiways were congested by other aircraft however. This meant the PanAm crew had to backtrack on runway 12 for take-off on runway 30. The entrance to runway 12 however, was blocked by the KLM Boeing. The PanAm flight had to wait for almost 2 hours before all KLM passengers had reboarded and refuelling had taken place. The KLM flight was then cleared to backtrack runway 12 and make a 180deg. turn at the end. Three minutes later (at 17:02) Pan Am 1736 was cleared to follow the KLM aircraft and backtrack runway 12. The PanAm crew were told to leave the runway at the third taxiway and report leaving the runway. At 17:05:44 KLM 4805 reported ready for take-off and was given instructions for a Papa beacon departure. The KLM crew repeated the instructions and added "We are now at take-off". The brakes were released and KLM 4805 started the take-off roll. Tenerife tower, knowing that Pan Am 1736 was still taxiing down the runway replied "OK ...... Stand by for take-off, I will call you." This message coincided with the PanAm crew's transmission "No ... uh we're still taxiing down the runway, the Clipper 1736". These communications caused a shrill noise in the KLM cockpit, lasting approx. 3.74 seconds. Tenerife tower replied: "Papa Alpha 1736 report runway clear. ", whereupon the PanAm crew replied: "OK, will report when we're clear". This caused some concerns with the KLM flight engineer asking the captain: "Is he not clear then?" After repeating his question the captain answers emphatically: "Oh, yes". A number of second before impact the KLM crew saw the PanAm Boeing still taxiing down the runway. The crew tried to climb away and became airborne after a 65 feet tail drag in an excessive rotation. The PanAm crew immediately turned the aircraft to the left and applied full power. The KLM aircraft was airborne, but the fuselage skidded over the PanAm's aft fuselage, destroying it and shearing off the tail. The KLM aircraft flew on and crashed out of control 150 m further on, sliding another 300 m bursting into flames. "The KLM aircraft had taken off without take-off clearance, in the absolute conviction that this clearance had been obtained, which was the result of a misunderstanding between the tower and the KLM aircraft. This misunderstanding had arisen from the mutual use of usual terminology which, however, gave rise to misinterpretation. In combination with a number of other coinciding circumstances, the premature take-off of the KLM aircraft resulted in a collision with the Pan Am aircraft, because the latter was still on the runway since it had missed the correct intersection." KLM Flight 4805 was a charter flight for Holland International Travel Group and had arrived from Amsterdam Airport Schiphol, Netherlands. Its captain was Jacob Veldhuyzen van Zanten, age 50. At the time of the accident, Veldhuyzen van Zanten was KLM's chief flight instructor, with 11,700 flight hours, of which 1,545 hours were on the 747. The first officer was Klaas Meurs, age 42. At the time of the accident, Meurs had 9,200 flight hours, of which 95 hours were on the 747. Flight engineer was Willem Schreuder, age 48. At the time of the accident, Schreuder had 15,210 flight hours, of which 540 hours were on the 747. The aircraft was a Boeing 747-206B, registration PH-BUF, named Rijn (Rhine). The KLM jet was carrying 14 crew members and 235 passengers, including 52 children. Most of the KLM passengers were Dutch, while also on board were 4 Germans, 2 Austrians and 2 Americans. After the aircraft landed at Tenerife, the passengers were transported to the airport terminal. One of the inbound passengers, who lived on the island with her partner, chose not to re-board the 747, leaving 234 passengers on board. Pan Am Flight 1736 had originated at Los Angeles International Airport, with an intermediate stop at New York's John F. Kennedy International Airport (JFK). The aircraft was a Boeing 747-121, registration N736PA, named Clipper Victor. Of the 380 passengers (mostly of retirement age, but including two children), 14 had boarded in New York, where the crew was also changed. The new crew consisted of captain Victor Grubbs, age 56, first officer Robert Bragg, age 39, flight engineer George Warns, age 46, and 13 flight attendants. At the time of the accident, captain Grubbs had 21,043 hours of flight time, of which 564 hours were on the 747. First officer Bragg had 10,800 flight hours, of which 2,796 hours were on the 747. Flight engineer Warns had 15,210 flight hours, of which 559 hours were on the 747. 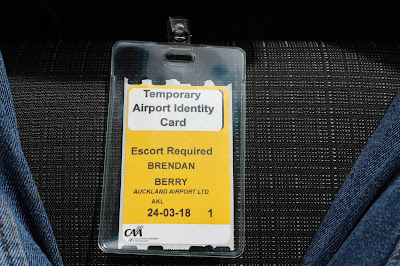 Knowing I was heading to Auckland in March I thought I would write to Auckland airport to see if I could get a airside tour of their airport. I didn't think it would go anywhere but it wouldn't hurt to give it a go. I was really surprised to get a reply with "we will discuss this and get back to you". Well after a few emails back and forward and sending off some personal information I am excited to say my request was granted. So yesterday at 10.15am I caught up with a gentleman by the name of Justis, together we went down to the airport security office where I signed in and got my TAI card. We then went across the road to a waiting Auckland Airport van (car 55) and this is where we met our personal tour guide, Ronald. An ex pilot for Air New Zealand and now working for Auckland Airport as a airside safety office. Ronald was very knowledgeable and extremely accommodating and very patient with me when I asked can we go over there, can you please stop here and so on. During our time together as we drove around the perimeter I was told by Ronald if you drive from one end of the airport to the other end on the permitter road doing 65klms per hour it will you 4 minutes. Auckland Airport (IATA: AKL, ICAO: NZAA) is the largest airport in New Zealand. 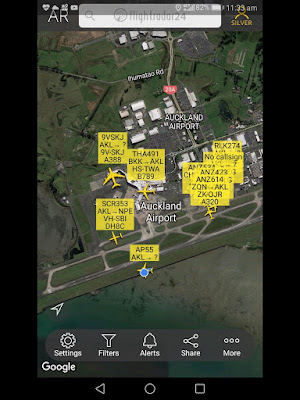 The airport is located 21 kilometres (13 miles) south of the Auckland city in the suburb of Māngere and the runway sits on the edge of the Manukau harbour (05 end). The airport has a single runway 05R / 23L and is 7 metres (23 feet) above sea level. I asked Ronald why they have L \ R on the numbers but are a single runway airport, and his response was "the main taxiway Alpha was once an active runway". Auckland Airport is both a domestic and international hub for Air New Zealand. It is one of only two airports in New Zealand capable of handling Boeing 747 and Airbus A380 aircraft. (the other being Christchurch airport). 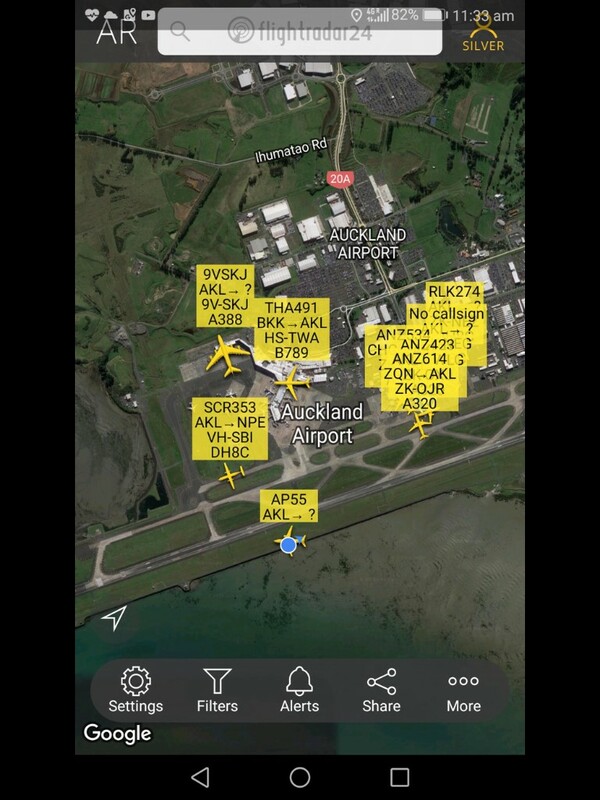 Auckland Airport has a capacity of about 45 flight movements per hour, using a single runway which is fully Cat IIIb capable. In November 2007 work began on a new northern runway, to be built in several stages and to be used mainly by smaller aircraft, freeing up capacity on the main runway. However, the project was put on hold for at least 12 months in October 2009, and deferred for a further few years in August 2010 following consultation with airlines and a review of capacity management options. The expected completion date for the second runway is now 2025. Auckland has 34 airlines calling in on a regular bases, 28 international and 6 domestic. I am really happy to show you the below photos from the day airside. I know this is something that doesn't happen everyday and I am so grateful to Auckland airport for giving me this opportunity. I feel very honored and privileged. This day would not have been possible without the support of all the team at Auckland Airport and I would like to say thank you to Kate for taking my original email and putting it forward for consideration. My sincere thanks also goes to the airport security team for taking the time to clear me, thanks also to Megan for organising the time we had with Ron. Thanks also goes to Justis for organising this whole adventure and for giving up a few hours Saturday morning for me. Last but not least thanks goes to our driver Ronald, you were amazing and made my time out on the field a memberable one.